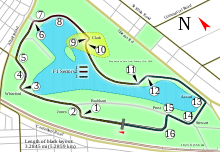 The 2001 Australian Grand Prix was a Formula One motor race held on 4 March 2001 at the Melbourne Grand Prix Circuit. It was the 66th running of the Australian Grand Prix and the first race of the 2001 Formula One season. The race was won by German driver Michael Schumacher driving a Ferrari F2001, but the race was marred by the death of track marshal Graham Beveridge during the race. This was the last trackside death in Formula One until the 2013 Canadian Grand Prix. Heading into the new season, several teams opted to retain their 2000 driver line-ups, while others changed drivers. One of the main driver changes involved Jenson Button, who moved from Williams to replace Austrian driver Alexander Wurz at Benetton. Wurz changed to test driver at McLaren. Ferrari retained three-time World Champion Michael Schumacher and Rubens Barrichello, while two-time World Champion Mika Häkkinen and David Coulthard continued at McLaren, Heinz-Harald Frentzen and Jarno Trulli continued at Jordan. Juan Pablo Montoya (Williams), Enrique Bernoldi (Arrows), Kimi Räikkönen (Sauber) and Fernando Alonso (Minardi) were all debutants. The first highlight of qualifying was Minardi's beleaguered Tarso Marques, and his rollercoaster bid to get below the predicted 107% barrier of 1m 33.5s for the first time all weekend. His lurid progress was two and a half seconds shy of that target, worryingly for team boss Paul Stoddart but hardly surprising given his lack of track time after a spectacular explosion of his European V10 on Friday. Also Finnish driver Kimi Räikkönen and Colombian Juan Pablo Montoya made their Formula One debuts. Jacques Villeneuve then opened the account for the front half of the field with an equally ragged lap that saw his underside take a particular beating at Turn 4. That likely cost him a second but, provisionally, he was on top and there he stayed in front of the impressive Kimi Räikkönen's Sauber and Juan Pablo Montoya's Williams. The Ferraris soon put an end to Jacques' moment of glory, but of the two it was Rubens Barrichello who stole a march – his 1m 28.178s putting over a second between himself and World Champion teammate Michael Schumacher. This in itself promised a lively afternoon, and obligingly Mika Häkkinen's McLaren rolled out of his garage to pick up the cudgels. Evidently this came as some surprise to the rest of the Bridgestone runners, and McLaren set about fitting in long runs for its two drivers. Meanwhile, Jacques Villeneuve's best run was spoilt when he collided with Juan Pablo Montoya while trying to dive inside the slow-moving Williams, causing surface damage to both cars and a little tetchiness between the two former CART champions. The red flags were duly brought out, ruining seven other drivers' runs including both the McLarens and the leading Jaguar of Eddie Irvine – who had his barge board knocked off by debris – although for Marques and Minardi it was a godsend. Burti meanwhile hurried back to the pits, but was not allowed back out: "We didn't put Luciano in the spare because we didn't want to overburden him and we wanted to preserve it for tomorrow," said Bobby Rahal ominously. After a little more than ten minutes the track was clear and the pit lane reopened. Barrichello tripped over himself in front of Mika Häkkinen but Ralf Schumacher thrust his Williams up among the Bridgestone boys with a time of 1m 28.218s to go fifth and maintain his position as the fastest of the Michelin men by some considerable distance. For Mika Häkkinen there was small encouragement in squeaking back onto the front row at the start of his long run, but after two slow laps he had no response to Rubens Barrichello on his final flier and it was a Ferrari lock-out. David Coulthard endured an anonymous session but he too stayed out longer, doing one cooling down lap and two hot ones in a desperate bid to claw back time. It failed, and his McLaren couldn't get beyond a fourth row slot. Almost unnoticed amid the last gasp brigade – in which Marques set his best time still shy of 107% – Michael Schumacher had climbed aboard the Ferrari T-car and headed out onto the circuit. With a little more than a minute to go and no hope of getting a final run in it was peculiar behavior, but nevertheless the German had sealed his first ever pole in Australia in dominant style with 1m 26.892s. Despite rolling his car during a practice session, Michael Schumacher led the race from pole. Rubens Barrichello, Schumacher's teammate, got off to a poor start, dropping from second to fifth by the first corner. Whilst attempting to regain position Barrichello tried to pass Heinz-Harald Frentzen's Jordan, but made contact and knocked Frentzen into a spin. Mika Häkkinen was second at this point. The newcomer Enrique Bernoldi, racing for Arrows, retired on lap three after colliding with the wall out of the first corner. A lap later, Jacques Villeneuve's BAR ran into the back of Ralf Schumacher's Williams at high speed whilst Schumacher was braking into turn three. The collision launched Villeneuve's car into the air toward the track-side concrete barriers, shedding wheels and bodywork as it cart-wheeled along the wall to a halt deep in the gravel trap. Ralf Schumacher spun into the same gravel trap after bottoming across the track and kerbs, with a missing rear wing and apparently compromised rear-left suspension, incapable of rejoining the race. Track marshal Graham Beveridge was fatally injured when he was struck by a fast-moving wheel from Villeneuve's car that had passed through a gap in the safety fence. The race was not halted, but the safety car was rapidly deployed and was out for 10 laps whilst medics attended to Beveridge. He was moved to the hospital, where he was declared dead. After the restart Schumacher led away again from Häkkinen and Barrichello. Far behind them Heinz-Harald Frentzen made a forceful move up the inside of Jean Alesi to trail Kimi Räikkönen who was putting in a deeply impressive debut with Sauber. Räikkönen in turn slid purposefully inside last year's new boy Jenson Button whose underpowered Benetton had no answer to the challenge for his tenth place. The next lap Button was called in for a stop-go penalty for the team's infringement on the grid. Up front Schumacher was piling on the pressure, building up a five-second advantage over Häkkinen by lap 25 before the two top men of the modern era found their opening exchanges curtailed. Häkkinen was chasing hard, when his left front suspension gave way at the end of the back straight, and the Finn suffered a very sizeable impact with the tire wall. The incident put Schumacher in a commanding 10-second lead over his teammate Barrichello, although the Brazilian had to contend with the sight of David Coulthard's McLaren looming large in his mirrors. Michael Schumacher continued to pull away at the front, whilst David Coulthard rapidly passed Barrichello (who would later mention that he suffered from handling problems during the race). By this stage Schumacher was 15 seconds further down the road, until he swept into the pits at the end of lap 37. Coulthard drove aggressively to try to cut down some of the advantage. Schumacher was underway in 10.7 seconds and rejoined behind Barrichello, some 15 seconds behind Coulthard . Barrichello came in at the end of lap 39 for his stop. Traffic, a full fuel load and the cold tires on Schumacher's Ferrari saw Coulthard's lead open to 18.1 seconds before he came in for his stop at the end of lap 41. He had done enough to keep ahead of Barrichello. The 2001 Australian Grand Prix was notable for the fact that two future World Champions, Kimi Räikkönen and Fernando Alonso both made their Formula 1 debuts. This was the first race for the Michelin tyre company's return to the sport. Luciano Burti's Jaguar was the highest placed Michelin runner in eighth place, two places out of the points. 1.^ Tarso Marques set a time outside 107%, but was allowed to race. ^2 – Olivier Panis originally finished fourth but received a 25-second time penalty after the race following overtaking under yellow flag. ^3 – Jos Verstappen originally finished ninth but received a 25-second time penalty after the race following overtaking under yellow flag. ^ Knight, Ben (7 November 2003). "Doctors found guilty of misconduct". PM. Australian Broadcasting Corporation. Retrieved 8 October 2011. ^ "2001 Australian Grand Prix". Formula1.com. Formula1.com Limited. Archived from the original on 29 October 2014. Retrieved 26 December 2015. ^ a b "Australia 2001 - Championship • STATS F1". www.statsf1.com. Retrieved 7 March 2019.